I recall hearing a story about the famous theologian Karl Rahner, S.J. A student going through a crisis of faith asked Rahner for books to read to regain his faith. Rahner replied: Rather than books, “go out and join a group of Christians who help the poor.” Somewhat similarly, it is said that for several years St. Vincent de Paul suffered temptations against the faith. How were these doubts and temptations resolved? They left him when he resolved to spend his life serving the poor. Deep down, at stake is the question of how and where we find and touch God. My opening statement is derived from another statement that has played a key role in the history of the church: “extra ecclesiam nulla salus,” that is, “outside the church, no salvation.” I argue that in the last few decades the Catholic Church, at a theological level, has moved from “outside the church, no salvation” to “outside of love of neighbor, no salvation.” Yes, this is affirming that one can be saved and reach eternal life without being a full member of the Catholic Church, without baptism by water and the seven sacraments, without explicit belief in Jesus Christ—indeed, even without explicit belief in God! Nor shall divine providence deny the assistance necessary for salvation to those who, without any fault of theirs, have not yet arrived at an explicit knowledge of God, and who, not without grace, strive to lead a good life. Note that the church affirms that grace is necessary; and in the Catholic tradition, all grace is the grace of Jesus Christ. How one is saved is put powerfully, positively and beautifully in the council document “The Church in the Modern World,” No. 22. All this holds true not only for Christians but for all people of good will in whose hearts grace is active invisibly. Because Christ died for everyone, and since all are in fact called to one and the same destiny, which is divine, we must hold that the Holy Spirit offers to all the possibility of being made partners, in a way known to God, in the paschal mystery. It is by contact with, sharing in and living the paschal mystery that anyone and everyone can be saved. In a word, being a partner in the paschal mystery means sacrificing, thinking of others, following Jesus—even to laying down one’s life for others. We can arrive at a similar conclusion by reflecting on the importance of “love of neighbor” in the Scriptures. In Matthew 25 we have a description of the Last Judgment. Note that the criterion of judgment is not belief in God, not membership in the church, not baptism, but whether one reaches out to help the poor, the person in need. “I was hungry, thirsty, in prison, etc., and you visited me.” Love of neighbor is the criterion. The person in need is where we not only touch and meet Jesus, but the place where salvation is gained or lost. A look at the Gospel of John and First Letter of John likewise affirms this centrality and indeed priority of love of neighbor. “I give you a new commandment, that you love one another” (Jn 13:34). And “This is my commandment, that you love one another as I have loved you” (Jn 15:12). Of course John does not deny love of God, but the emphasis here is strongly on love of neighbor. The letter of John is even stronger: “The message from the beginning is that we should love one another” (1 Jn.3:14). He continues that “those who say ‘I love God’ and hate their brothers and sisters are liars, for those who do not love a brother or sister whom they have seen, cannot love God whom they have not seen” (1 Jn.4:20). St. Paul too emphasizes love of neighbor. “The commandments...are summed up in this word, ‘love your neighbor as yourself’” (Rom 13:9). The letter of James states that “religion pure and undefiled is to care for the widow” (Jas1:26). He continues that “faith without works is dead” (Jas 2:26). 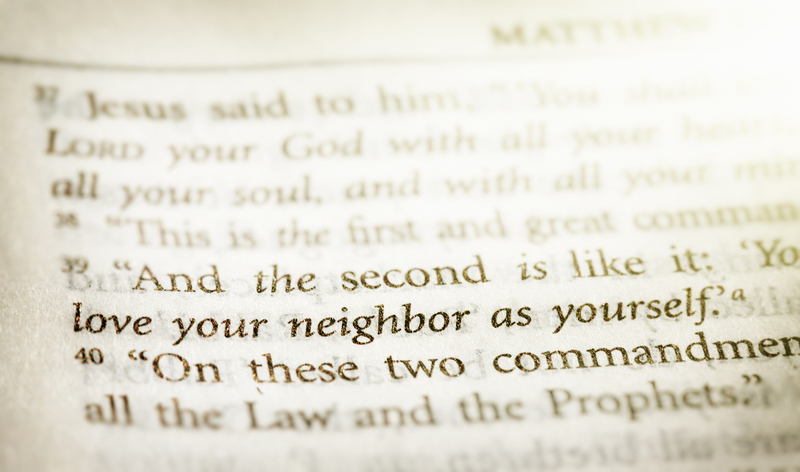 Dare we say that in reality there are not two great commandments, but one, namely to love the neighbor? We can love the neighbor only if we love God, and the way to show our love for God is by loving the neighbor. We have expanded our view of Jesus Christ to say that if we love our neighbor we are living with an implicit or anonymous faith in Jesus Christ. How did this shift, this renewed emphasis on “love of neighbor” rather than focus on the love of God come about? And what does it reveal about the nature of Christianity? One factor would be that we see men and women of all religious traditions, and those without faith in God, who do love the neighbor. From our Christian perspective, we say that for this to be possible, God’s grace and love must be with them. Thus we have a more generous and more expansive view of how God’s grace is present and operative in the world. We have expanded our view of baptism from water baptism to include baptism of desire. We have expanded our view of Jesus Christ to say that if we love our neighbor we are living with an implicit or anonymous faith in Jesus Christ. What does this mean for the mission of the Christian and the Christian churches? Clearly there is a shift. No longer do we think of those unbaptized as sent to hell or limbo. Infants who die without baptism are entrusted to the love and mercy of God (Catechism of the Catholic Church, No. 1261). We say too that the Jewish covenant is still valid and that the Jewish people will be saved by being faithful to that covenant. See the 2015 Vatican document, “The Gifts and Calling of God are Irrevocable.” Those who do not believe in God can be saved by following their conscience and leading a good life. This, as we explain here, means loving the neighbor. Rather than undercutting or minimizing the importance of the Catholic Church and membership in it by this emphasis on love of neighbor, the Church should be a visible sign of love of neighbor. Pope Francis remarked that we do not have the obligation to proselytize. At the same time, he emphasized that Catholics should evangelize by the living example of their love. The Church will grow by being an attractive witness. Similarly, instead of undercutting or minimizing the importance of the Mass for Catholics, the focus on love of neighbor gains new emphasis and power from the Catholic liturgy. Pope John Paul II spoke of the Mass as “the permanent school of charity, justice, and peace,” and as the “school of active love for the neighbor.” The Mass leads to mission, especially to love of neighbor. Moreover, if we focus on the meaning and centrality of love of neighbor, we gain insight into the special nature of Christianity. Christianity is not so much a series of doctrines, articles of a creed, but a way of life, the way of love. Christianity is a worldly religion, rooted in the world, and that is where we find and serve God. That is where we achieve salvation. In Jesus Christ we see God and humanity, God and the neighbor come together. In Jesus Christ we see that God is love, and that to love God we must love the neighbor. There is an inseparability between love of God and love of neighbor. It is one movement, the movement enabled by grace (the grace of God in Christ Jesus) to which we give witness. God is found in the near, in the neighbor, as well as in the transcendent. God is found in love more than in fear. Rather than a reduction or shrinking of Christianity to love of neighbor, it is an expansion, so that God is met every day, especially in the person in need, as in Matthew 25. Rather than God being edged out or eliminated, God is found in the near, in the neighbor, as well as in the transcendent. God is found in love more than in fear. I hope these reflections can show the wisdom of the words of Rahner that we began with. If you want to find or re-find God, go out and join those who love and help the poor. Jesus Christ is a model for this in what he did and what he said. “Greater love has no one, than to lay down his or her life for a friend” (Jn 15:13). Jesus preaches and lives the story of the good shepherd who goes out in search of the lost. Jesus tells us to model our lives after the good Samaritan, and after the father in the story of the prodigal son. The secular is not really secular. In the Christian, incarnational worldview, our task is not to flee from our world as if it were a vale of tears, a place of exile. Rather it is to see earth as a garden. We are laborers in the Lord’s vineyard, bringing love, being love in our world. Yet we should not think that this emphasis on love of neighbor is easy. As Dorothy Day reminds us, “Love in action is a harsh and dreadful thing.” All too often, we can and do remain self-enclosed, self-centered instead of reaching out to see, touch, help the neighbor. Finally, in a strange paradox, the Second Vatican Council reminds us that because we are Roman Catholics, we will be judged not more mildly but more severely. We have been given more. In Christ we have a deeper revelation of the love of God. If we fail to respond to this, we shall be judged all the more severely. All the church's children should remember that their exalted status is to be attributed not to their own merits but to the special grace of Christ. If they fail, moreover, to respond to that grace in thought, word and deed, not only shall they not be saved but they will be the more severely judged (“Constitution on the Church,” No. 14). This article also appeared in print, under the headline "Without Love of Neighbor, No Salvation ," in the February 18, 2019 issue. Peter Schineller, S.J., is a former associate editor of America.